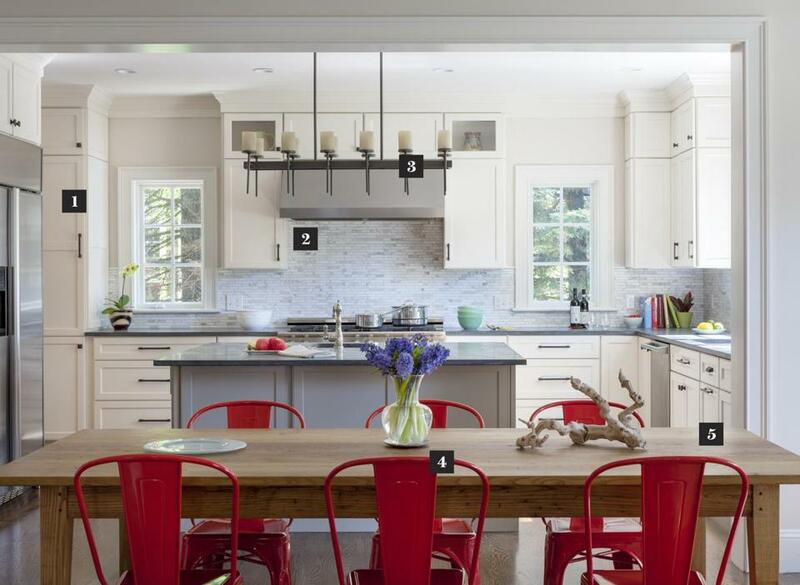 A family of five loves to hang out in this sunny room with plenty of counter and table space. Eager to remain in the same school district, a Needham couple learned that finding a bigger home there with a larger yard for their three children would be no easy task. 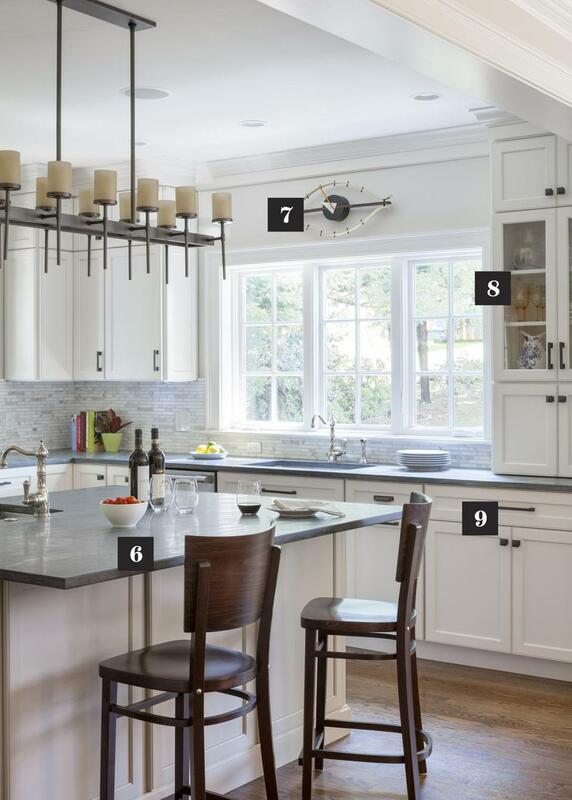 When they decided to build anew on a generous lot, they brought in Charlestown-based interior designer Jeanne Finnerty to help create a scheme for their interiors that suits their “transitional with a modern streak” tastes. A larger, more functional kitchen was a prime part of the plan. “My vision was to create a kitchen that is light and balanced, with a subtle color palette,” Finnerty says. Her design included plenty of storage, counter space for food prep and cooking, and natural light. And the combination of island and large dining table ensures there’s always space for children to complete their homework while spending time with Mom in her favorite room. “It is at once elegant and family-friendly,” says Finnerty of the room. 1. The cabinetry is painted oyster white, a color that is repeated on the trim throughout the other first-floor rooms, creating a custom look, Finnerty says. 2. The backsplash, a marble tile with variegated tones of gray, was kept quiet and harmonious. 3. The linear candle pendant from Restoration Hardware is large and wide, like the island below it, but visually lightweight. 5. Finnerty accented painted kitchen cabinetry with natural woods. Though made from reclaimed wood by Vermont Farm Table, the custom table has a refined feel and is scaled to fit the space. “I love the warm wood with the red metal chairs,” Finnerty says. 6. Painted taupe, the island provides a touch of contrast to the white cabinets and complements the stainless steel appliances and range hood. 7. When the homeowner spied this clock, she couldn’t resist buying it for her husband, an eye doctor. Finnerty applauds design choices that have personal meaning to the homeowners. 8. Glass-fronted cabinets create a place to show off pretty kitchenware. “Decorating with objet d’art collections is nice, but even simple everyday matched glassware or canisters will do the trick,” the designer says. 9. Dark bronze cabinet hardware plays off polished nickel faucets and the stainless appliances and makes for a pleasing mix. “Too much of one metal finish can look repetitive,” Finnerty says.